Bukit Lawang Travel Tours now available here! Bukit Tinggi, literally meaning high hill, is the cultural centre for the Minangkabau people. Situated in West Sumatra at 1 degree south of the equator and 930m above sea levels situated in the Agam Valley. While Padang is the modern commercial, educational and administrative centre of the province, Bukittinggi is the cultural centre of the Minang realm. Historically the Minangkabau is a matriarchal society meaning that the women rules the roost. Land and home ownership is always bestowed on the women. The ancient homeland of the Minangkabau - the luak nan tigo or 'three valleys' of western central Sumatra is a beautiful highland region of lush rice fields, towering volcanoes and spectacular crater lakes. The MinangKabau get their name from an old folk lore of the West Sumatrans being challenged to a bull fight by a Javanese invaders. Minang means to win and Kabau means a bull. Read the whole folk lore here. Still today the locals enjoy a good day out watching the bullfighting. For more information check this page. In the centre of Bukittinggi is a clock tower (Djam Gadang). Built in 1926 the clock was a gift from the queen of Holland. 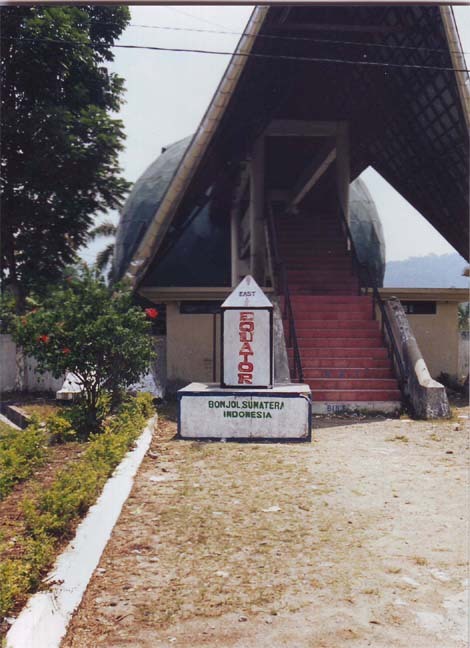 When first built the tower had a domed top though when Indonesia gained independence the top was changed with the symbol of the buffulo horns, the symbol of the Minangkabau people. Bukittingi is surrounded by mountain ranges. From Bukittinggi you can look up to Gunung Singgalang (2880m) and Gunung Marapi (2891m), usually the tops shrouded in mist and clouds. Close to town is also Gunung Gago and Gunung Pasaman. Gunung Marapi is an active volcano which last erupted in 2004. It is generally off limits to climb. Some people still climb the volcano which can take about 5 hours to get to the top. At Bukkittinggi there is the remnants of the old Fort de Kock which was built by the Dutch during the Padri Wars (1821 - 1837). There only remains a defensive moat and a few rusted cannons. The site is built on a hilltop which offers some excellent views over the town and surrounding countryside. Across from the Fort de Kock is a museum and then connected by a suspension bridge is a poor excuse for a zoo. The zoo contains 2 Sumatra Elephants chained at the feet, 3 Sumatra Orangutan (2 male and 1 female), 1 Sumatran tiger, 1 camel, 2 sun-bears, some deer, 2 monkeys, 3 siamang, 5 crocodile and a variety of smaller animals. Unfortunately the animals cages are littered with rubbish thrown in by locals trying to be kind by feeding them with crisps, lollies, plastic bottles and aluminium cans. Just on the southern outskirts of Bukkitinngi is Panorama Park just 2km from the centre of town. Here you will get great views of the deep Sianok Canyon. Also from the park you can gain access to the extensive grid of caves (Lobang Jepang) built by the Japanese in 1942 during WWII using slave labour. Entrance to the park and caves is 3000Rp. There is a tame troupe of monkeys around the park well fed by the tourists. Next to Panorama Park is the Military Museum with a collection of photos and artifacts from the war of independence from the Dutch, the Communist attempted coup in 1965 and from Indonesia's war against Fretilin guerrillas in East Timor. On Jl. Soekarno - Hatta is the house where President Soekarno was born and raised before becoming President, uniting Indonesia and gaining independance. Traditional dancing and music of the Minangkabau can be viewed at the Cultural centre every night. Located on the road connecting Jl Sudirman and Jl M Yamin. Picturesque Lake Maninjau is one and a half hours away by bus (38Km) and there are plenty of inexpensive lakeside guest houses. To get there go to the bus terminal in Bukittinggi and there are regular buses going to Danau Maninjau. Cost is 13,000Rp. Bukit Tinggi is located just south of the equator. 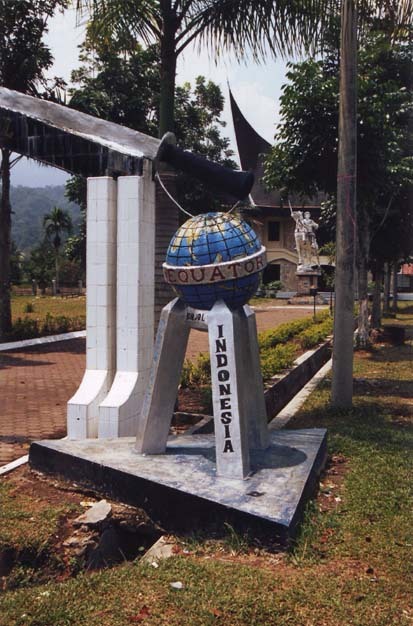 A marker is located on the highway marking where the equator runs. There is a Rafflesia Sanctuary in the Rimba Pati Nature Reserve about 16km north of Bukkittinggi. The flowers bloom from August to November. Ngalau Kamanga is a 1500m cave 15km north-east of Bukkittinggi which has great examples of stalactites and stalagmites. These caves were used by Sumatran guerrillas to launch attacks against the Dutch in the 19th and 20th centuries. Padang is 90kms, 3 hours away by bus from Bukittinggi where you can get a Pelni ferry to Jakarta, Sibolga or the Mentawai Islands. Between Bukittinggi and Jambi is the largest mountain in Sumatra, Gunung Kerinci an active volcano (3805m). There are a few money changers throughout Bukittinggi though you will often get a better exchange rate at the numerous gold shops marked 'Toko Mas'. There are a fair few internet cafes in Bukittinggi charging 4000Rp per hour for fast reliable connections. The majority of these cafes are located on Jl. A Yani. The closest airport is in Padang. There are regular buses to and from Padang. Buses from Pekanbaru take 6 hours and cost 45,000Rp. Buses through to Dumai take around a further 6 hours from Pekanbaru. There are many backpacker style hotels along Jl. A Yani. Hotel Singgalong Indah is backpacker style accommodation 10 minutes walk to the centre of Bukittinggi. Prices from 70,000Rp. For picture, prices and contact details click here. Orchard Hotel (1 review) is a budget hotel a few minutes walk to the centre of Bukittinggi. Prices from 75,000Rp. For picture, prices and contact detail click here. Yuriko Hotel (2 reviews) is a budget hotel in the centre of Bukittinngi close to the clock tower. Prices start from 100,000Rp per night. For pictures, prices and contact details click here. Hotel Pemandangan (Mountain View Hotel) is located on Jl. Yos Sudarso close to the centre of Bukittinggi. Prices from 125,000Rp per night. For picture, prices and contact details click here. Indria Hotel a budget hotel close to the the clock tower. With prices from 125,000Rp. For picture, prices and contact details click here. Hotel Kartini (2 reviews) close to the centre of Bukittinggi with prices starting from 125,000Rp. For picture, prices and contact details click here. Gallery Hotel (4 reviews) right in the centre of Bukittinggi, next to The Hills hotel and 2 minutes walk to the clock tower. Prices from 150,000Rp. For picture, prices and contact details click here. Hotel Mitra Arena located in the heart of Bukittinggi. Prices from 175,000Rp including breakfast. Also travel agent so can arrange city tours around Bukittinggi as well as surrounding area including Lake Maninjau. For picture prices and contact details click here. Kharisma Hotel (6 reviews) located on Jl. Jend. 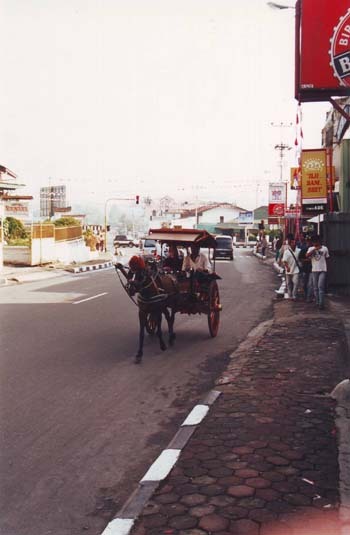 Sudirman in Bukittinggi. 2009 prices from 175,000Rp per night. For picture, prices and contact details click here. Hotel Bagindo in the centre of Bukittinggi close to the clock tower on Jl. Jend. Sudirman No 45. Prices from 200,000Rp. For picture prices and contact details click here. Hotel Amburi Suri (2 reviews) in the centre of Bukittinggi close to the clock tower. Prices from 250,000Rp. For picture, prices and contact details click here. Beteng Hotel with prices from 300,000Rp per night. For picture, prices and contact details click here. Sari Bundo Sati Hotel with prices from 350,000Rp. For picture, prices and contact details click here.